BERKELEY, Calif. (BRAIN) — The Youth Cycling Alliance, which was formed last year following a meeting at Interbike, is working with UC Berkeley's Haas School of Business to map and assess existing youth cycling programs around the country. BOULDER, Colo. (BRAIN) — After a year on hold, IMBA is relaunching its Model Trails program, which recognizes outstanding mountain bike trails and locations. Trails are awarded with Epic designations and gold, silver and bronze-level Ride Center designations. BOULDER, Colo. (BRAIN) — Camber Outdoors has elected three new board members, including Roger Gierhart, a vice president at Trek Bicycle Corp.
MORGAN HILL, Calif. (BRAIN) — The Specialized Foundation has opened applications for its cycling program, Riding for Focus, for middle schools (grades 6-9) throughout the U.S. for the 2017-18 academic year. The application period is open now through March 24. BOULDER, Colo. (BRAIN) — Camber Outdoors has announced that Arc’teryx and Patagonia have become Peak Partners, a three-year contribution above both companies’ membership dues to Camber Outdoors, and will advance programs to support and accelerate women’s leadership and participation in the outdoors. IRVINE, Calif. (BRAIN) — The company’s support includes a combination of product allocation and financial backing, which will be used to enable neutral support at league races and provide NICA the resources to expand interscholastic cycling across the country. IRVINE, Calif. (BRAIN) — For the past nine years, cyclist and advocate Andy Lightle has celebrated his birthday in an unconventional fashion. Rather than throw a party or indulge in gifts for himself, Lightle decided in 2008 that he would raise money for someone in need instead. 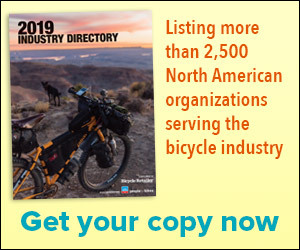 BOULDER, Colo. (BRAIN) — Camber Outdoors and the Bicycle Product Suppliers Association are offering scholarships to bring four people to the Bicycle Leadership Conference this April in Monterey, California. BERKELEY, Calif. (BRAIN) — The National Interscholastic Cycling Association has added four new board members, done some organizational restructuring and added new staff to meet the needs of continued growth in high school mountain bike racing.